The Maui Island Series is a full service convenience center solution ready for high volume use with its large capacity and easy maintenance. 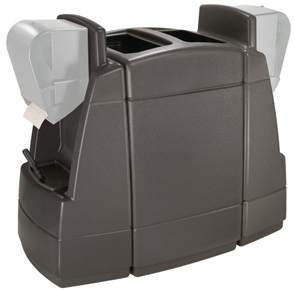 Provide convenient value added amenities right at the pump with windshield service center side pod caddy. 55 Gallon Double Sided Waste Container. 2 Removable 27.5 Gallon Liners with Built-In Hand Grips. Maui Side Pod Windshield Service Center. 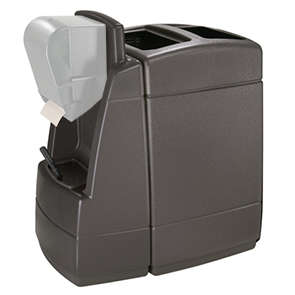 Meets the ADA requirements with easy-to-reach squeegee bucket and towel dispenser. Suitable for all climates, units made from 25% post consumer recycled (PCR) material, tough enough for the harshest winters and sturdy enough to maintain their stylish look even in the hottest summer temperatures. Accommodates a Variety of Roll Towel Dispensers (Dispenser Not Included). We recommend contacting your local paper or janitorial company.